Thank you so much for your continuing support of Project Chacocente! Your sponsorship is truly making a difference in the WHOLE life of your child, the families of Project Chacocente, and the families in the surrounding communities. We reached our goal of $25,000 that was then matched by an anonymous donor! Many thanks to all those who helped us reach this goal. Your efforts mean the continuation of the many wonderful things that are happening at the Chacocente Christian School. 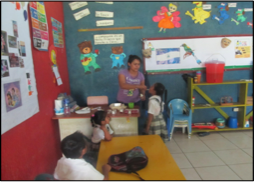 One of the things we try to do at the Chacocente Christian School is promote healthy habits. Indoor bathrooms, some even with showers, have been constructed so that the children can learn good hygiene. Teeth brushing is also an important habit, and the children learn early to brush after eating. 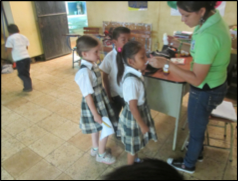 Periodically municipal nurses come to give inoculations, and this past August, under the supervision of the teachers, the children’s heads were inspected and washed to rid them of lice. They were also given medication to eliminate internal parasites that are very common in this area of scarce potable water and no municipal sanitation system. We are very proud of the devotion and expertise of all of our teachers. Aiming to provide academic opportunities far above those available at state-run schools, we hire only qualified, capable Christian teachers. We recognize that most teachers in Nicaragua are grossly underpaid (often earning less than sweat shop workers) and we are committed to fairly compensating our employees. We’re hoping you will help us! Please consider sponsoring a teacher! Your $500 monthly sponsorship will better the lives of not only the teacher but also the lives of his or her students. Join together with friends and churches to truly make a lasting effect. Several young people at Project Chacocente are also interested in expanding their education, especially in studying English, and we want to help them! Education will increase their self-esteem and job marketability. Can you help? Partial scholarships, as well as full scholarships, are greatly appreciated. If interested please email projectchacocente@gmail.com or call Robyn at 585-752-9070. Urgent! Additional sponsors are still needed to provide the necessary funds to run the school. If you know someone who might be interested in sponsoring a child for $360 a year, have him or her contact us at helpchildoutofthedump@hotmail.com. For more information and further updates, visit the Project Chacocente website, www.outofthedump.org or friend us on Facebook at Friends of Project Chacocente. Thank you for your continued interest in and support of Project Chacocente. Remember to always label any donations, including sponsorship payments, with the child’s name and payment period on the memo line or what the donation is to be used for, for example, the general budget or teacher salaries. Or you may wish to include a note explaining your donation.